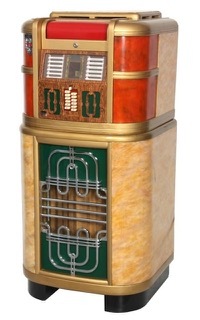 Amajor collection of 8,000 hot jazz LPs and 78s was donated recently by the estate of Donald Ross and it includes this swell 78rpm jukebox! Agreat complement to our Great78Project. June 18, 1942 - June 1, 2018 Donald Ross, a playwright and screenwriter, succumbed to cancer after a long battle. He is survived by son Max Ross, daughter Alexis Hill, daughters-in-law Daphne King Ross and Jennifer Fedin, grandchildren Violet Ross and Xander Fedin-Hill, and cousins Lynda Levy and Lenore Stadlen. Donald was predeceased by his wife of 49 years, noted voice over artist Patti Deutsch Ross. Over a 30-year career, Donald wrote some of TV's most popular variety shows, comedies, and dramas: This is Tom Jones, Dinah!, Diff'rent Strokes, The Love Boat, Matlock, and Murder, She Wrote, including that show's final episode. Paired with Patti, Donald was successful on camera as a regular on the celebrity game show Tattletales. He tapped his lifelong love of hot jazz to produce and write the Peabody and Christopher Award winning Timex All-Star Swing Festival (1972). Materials from those shows along with six stage plays, the screenplay for Hamburger, the Motion Picture (1985), his Emmy certificate for Dinah!, and other selections from Donald's career are at the Howard Gotlieb Archival Research Center at Boston University, his alma mater. In lieu of flowers, consider a donation to The ARChive of Contemporary Music, the next home for Donald's world-class jazz record collection. And hoist a shot of cheap Scotch, in a rock glass, but no rocks. A celebration of Donald's life is planned.